“Be prepared” is good advice for Boy Scouts and commercial roofing contractors. Just ask Spokane Roofing Company® owner Jeff Sitton, who recently began a project for the Idaho Transportation Department (ITD) that reminded him, no job turns out to be exactly what he expects. The ITD project in Coeur d’Alene, ID involved removing an old ballasted roofing system and replacing it with modern GAF TPO membrane roofing. It was a 13,000 square-foot job that presented numerous challenges and, as usual, a happy ending for the customer. A ballasted roof system uses river rock atop roofing membranes to hold them in place; nothing is screwed in or glued down. It is less expensive than alternative methods, said Sitton, but replacing a ballasted roof system is not easy. When removing the rock by mechanical means proved unfeasible, it was time for Plan B. The challenge was to get the rock off the roof in a timely manner. It was a government project, and the ITD expected the job to be done on time, without additional expense. So, Sitton hired labor to move the river rock and then used an extended-boom forklift to lower it to the ground. That took three days, because the rock had to be removed in sections. New membranes were stacked temporarily on top of old ones to avoid the possibility of losing the roof to high winds. He is proud of the project’s progress. The Composite Materials and Engineering Center (CMEC), which inspected the work to date, was impressed with the craftsmanship of SRC’s work, too. 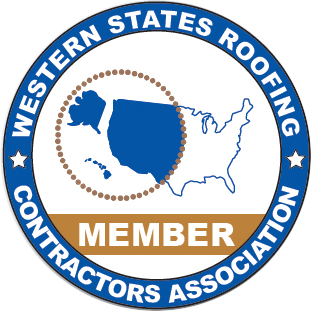 Spokane Roofing Company is public-works certified (Idaho Contractor License Number 013623-C-4), a requirement for a commercial roofing contractor to bid on government projects. Each project must be completed within parameters provided by structural engineers contracted with the state. Sitton is not a big fan of ballasted roofs, so he was happy to see ITD replace it with an updated system. Every flat roof leaks eventually, and it is hard to find leaks in a ballasted roof because you have to remove the rocks. In this case, the flat roof had been leaking for a long time, so there was quite a bit of interior damage as well. For the ITD project, Spokane Roofing also used AEP Span architectural wall and roof panels built by Evergreen Fabrication of Spokane Valley, WA. The project was designed by RGU Architecture of Lewiston, ID. The moral of the story? You cannot put a price tag on experience. Whatever challenges arise during a project, Spokane Roofing Company is prepared to meet them. Does Your Building’s Ballasted Roof Leak? Is your building’s leaky, ballasted roof interfering with your business? Then call Spokane Roofing at (509) 838-8633 about a commercial roof replacement. Our experienced commercial roofing team will get you a replacement roof that is significantly lighter, easier to maintain and lasts decades.